Syndicated Traphouse performs at Mayfest’s annual Battle of the Bands competition Friday night at 27 Live. The band was chosen the winner out of seven competing to play a set at Dillo Day. Weeks before battling for a Dillo Day spot at Mayfest’s annual Battle of the Bands competition held on Friday, the band Syndicated Traphouse had to learn a new set. “When you get a group that really gels together and has a lot of fun playing the music, it’s really easy to just get stuff done,” said Bienen and Weinberg sophomore Alex Gandolfo, a member of the band. 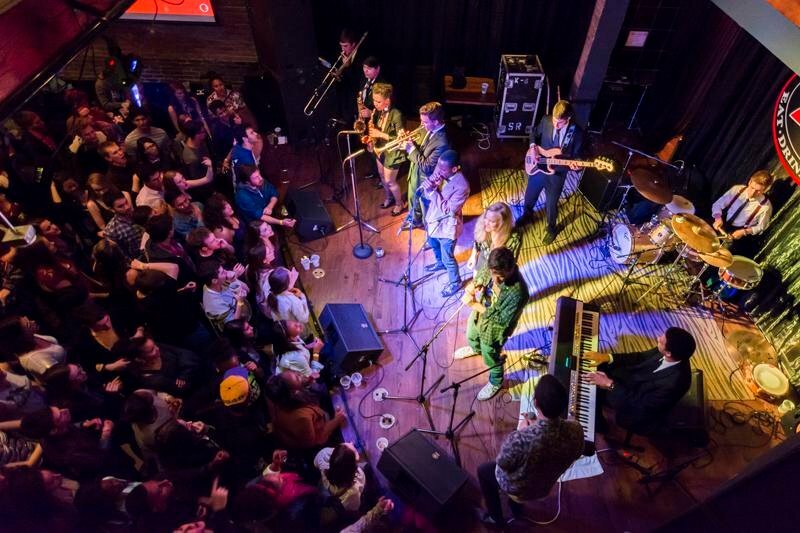 The last of the seven student bands to perform at Friday’s competition, Syndicated Traphouse earned the right to open at Dillo Day when they won Battle of the Bands. “At that performance, we all found it,” Gandolfo said. Syndicated Traphouse is a recent fusion of the bands Syndicate 119 and Appomattox Traphouse. Leading up to the competition, the members worked on creating their ideal sound. Gandolfo said that learning “Roses” by Outkast was the band’s hardest challenge. However, it is the cover that comes closest to their targeted blend of music. All members of Syndicate 119 — Gandolfo, Alex Warshawsky, Cameron Kerl, Curtis Boysen, Julius Tucker, Kamila Muhammad, Katharine Hedlund, Michael Jones and Thaddeus Tukes — are in the jazz program in Bienen School of Music. Warshawsky, a freshman, said the style of Syndicate 119 is a direction away from jazz, as it incorporates hip-hop, funk and R&B styles as well. Medill junior and former Daily staffer Gideon Resnick and Communication junior Adam Slater, the two members of Appomattox Traphouse, are both rappers and write all of their verses. Slater said combining with Syndicate 119 is probably the “coolest” collaboration they could have achieved. “They’re all very well trained, and it’s very to cool to play live music with them because we’ve never had that chance,” Slater said. Even after their win, there’s still a lot to do before Dillo Day, Gandolfo said. The set for Dillo Day is 45 minutes long, and Syndicated Traphouse has never performed together for that amount of time. With original songs written by the band members, Syndicated Traphouse will continue to develop their set. The band will also try to incorporate some of the other styles of music they heard at Battle of the Bands. During Battle of the Bands, Warshawsky watched the other bands go before his and said it was nerve-wracking playing last because he wanted to create the same level of energy as the other competitors. “Once we were up there and it was clear that the audience had that same energy, at that point it just became a lot of fun,” Warshawsky said.